This lifejacket or PFD Type 1 made for Dr. 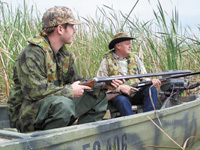 Duck is very popular with duck hunters or shooters. It is Australian Standards Approved as a 150N lifejacket. 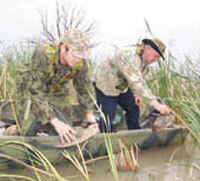 This lifejacket or PFD type 1 bladder is housed in a oz camouflage (auscam) fabric valise. It is different from the marine version of SMA1060 in that the lifejacket's valise is longer and the placement of the cylinder is located at a different area to avoid the recoil impact. In addition, this lifejacket has a D ring for attachment to the "dead man's" switch of your outboard motor. This lifejacket has all the physical features of SMA 1060 marine lifejacket or PFD ie very light & comfortable & non restrictive. Will not impede your hand movements. Able to right an unconscious person to safe inclined & face up angle in less than 3sec. This inflatable PFD Type 1 is manufactured by Safety Marine Australia Pty Ltd.